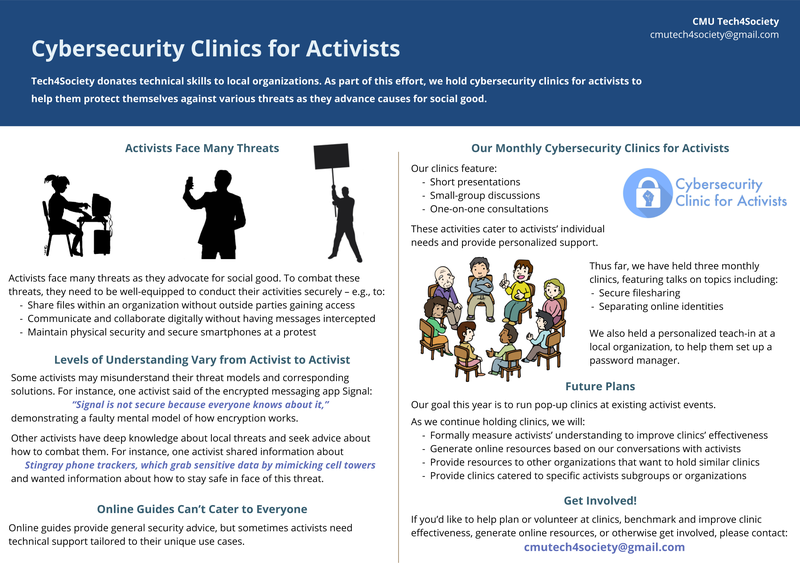 Our group runs cybersecurity clinics specifically catered towards activists, providing general education/advice as well as personalized support. We’re also seeking other ways to best educate the Pittsburgh activist community about cybersecurity. Our project team consists of a mix of “cybersecurity experts” and general technical people. We welcome anyone interested in this topic to join the team, whether they’re coming in with expertise or are excited to learn on the job! We held three “monthly” clinics in March, April, and May of 2017. We also held a personalized teach-in at a local organization to help them install and set up a password manager. Based on feedback from attendees, we believe that these clinics were valuable to those who attended. However, attendance was somewhat low; upon discussion with other cybersecurity groups, we found that they had had similar issues with attendance. Together with these other groups, we brainstormed that planning “pop-up clinics” at existing activist events might be a better path forward. Our main goal this year (2017-18) is to set up a framework for and then run some pop-up clinics. To stay updated on events, please follow our Cybersecurity Clinics Facebook page or join our mailing list. We will also send updates through the Tech4Society mailing list.